Albert is a local from the Ryde area and graduated from Malvina High school. He completed his undergraduate training in 1989 after 4 yrs of hard study at Cumberland College of Health Sciences. His initial career involved working at the Royal Prince Alfred and Concord Hospitals. After several years of working, he realised how much there was to learn about the human body and had more questions than answers!! He developed a special interest in the management of musculoskeletal injuries. To pursue this interest he returned to Uni to complete a post graduate diploma in Manipulative Physiotherapy. After another full year of intensive study he gained invaluable skills in the assessment and treatment of back, neck and sporting injuries. This higher level of intense training is only completed by a small % of physiotherapists (about 5%) making them world leaders in this field of Musculoskeletal Physiotherapy. Albert is committed to providing the most up to date and evidence based treatment to his clients. This is achieved by attending regular continuing education courses. This also includes travelling around Australia to attend a National Musculoskeletal Conference every 2 years. As Albert has matured as a physiotherapist his focus has changed to a more holistic approach. Isolated injury in the body is unusual and mostly has an underlying cause. Through his experience he has found that focusing on the injured area of the body alone does not address these casual factors. Over the past several years he has undertaken advanced education and completed the “Discover Physio” series of courses. Learning the “Thoracic Ring Model” (LJ Lee) and “Integrated systems model” (Lee and Lee). He has also been selected as a course assistant on subsequent courses held by LJ Lee. These models have helped him understand how the body functions on a much deeper level, further enhancing his expert clinical skills. As well as being a committed clinical physiotherapist, he is also a proud dad of 4 children. His interests include photography, gardening and playing O/45’s for the West Pennant Hills Cherrybrook Lions. Continuing to play sport and yes, suffering a few injuries along the way helps him relate and empathise with his injured clients. 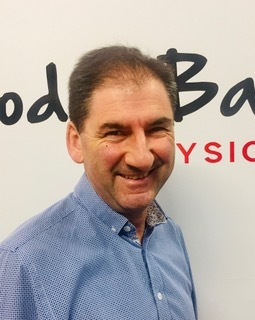 Over the years he has been involved with several sporting teams as their team physiotherapist. Examiner for Australian Examining Council of Overseas Physiotherapist. Undergraduate Physiotherapist supervisor Education 1993-1995.